Peppery watercress and creamy feta make an excellent pesto for this vegetable accompaniment. 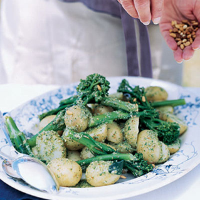 For the pesto, blend the watercress and feta in a food processor with the lemon juice, zest and half the pine nuts. Now slowly drizzle in the olive oil until almost smooth. Season to taste, then remove and chill in the fridge. Cut any large potatoes in half. Bring a large pan of water to the boil, add the potatoes and cook for about 12 minutes until just tender. Then add the broccoli spears and cook for a further 4-5 minutes until tender. Drain and refresh under cold water. To transport, once cooled, toss the vegetables in the pesto, place in a plastic container and chill. Place on a serving dish and sprinkle over the remaining toasted pine nuts.